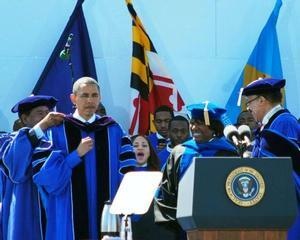 Hampton, VA - Hampton University students often joke that HU President William R. Harvey owns a weather machine. Well if he does, the dial was set on perfect this past Sunday. 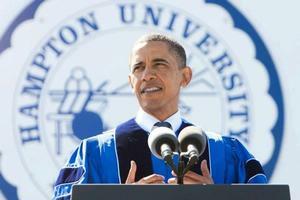 Sunny skies and mild temperatures welcomed U.S. President Barack Obama as the keynote speaker of the Hampton University 140th Annual Commencement. Excitement has been building among the graduates, faculty, staff, parents and the community about the Commencement since Obama was announced as the speaker in February. Attendees lined up on Marshall Avenue in front of the Armstrong Stadium long before the sun rose. Once the gates were opened proud parents, grandparents, other relatives and well-wishers hurried in to get to their seats. The processional started promptly at 9 a.m. and the graduates and faculty, proudly marched in. Media representatives from all over the country snapped photos and shot video of the 1,072 graduates. Harvey welcomed Obama and compared the similarities between Obama and HU. In his address, Obama did indeed challenge the HU Class of 2010 to serve the community by being good mentors and role models. Obama challenged the graduates to be persistent like Americans before them who wanted a better life for their children and grandchildren. Obama also became an honorary Hamptonian on May 9, 2010. Harvey and Chairman of the Hampton University Board of Trustees, Frank Fountain presented him with the honorary degree Doctor of Laws. The President also took a little bit of HU back with him to Washington D.C. Harvey presented him with a sapling of the Emancipation Oak, an athletic jacket with President Obama and Hampton University written on it and gifts for his family.